"The Happy Ball goes out for some food. but here comes a group of bad men who hold the place. The Happy Ball has to avoid the bad to look for food but he falls into trouble. Who will do him a favor?" Finally, a GameKing game whose box blurb somewhat matches its actual gameplay. There's no blithering nonsense about 'vagrants', 'extra terranits' and no appearance of that popular GameKing verb 'interlard'. instead you get a straight up description of events. You're a hungry ball, looking for food and some bad people are out to stop you. Ignoring the box art which appears to have been plundered directly from one of the Rune Factory games, you're probably thinking that this is going to be a Pac-Man clone. While it is a clone, as nearly all GameKing titles are, the game being plagiarised here isn't the famous 80's maze gobbler but another genre classic: Lode Runner. The reasons for choosing a ball as a sprite make total sense on the GameKing's limited resolution screen especially when it's important to keep that sprite as small as possible in order to fit as much of the multi-directional scrolling stage on screen as possible. This is because, as with Pac-Man, Lode Runner is a game where you need to have a fairly good idea of where the enemy is. For those that haven't played it, Lode Runner and by virtue of copyright infringement, Happy Ball, is a platformer of sorts that involves exploring a stage both horizontally and vertically as you seek to collect the items scattered across it before escaping. Trying to stop you are 4-6 generic baddies, hilariously described in the manual as "boring balls". The player cannot jump which means that enemies can corner him and, of course, kill him upon contact. To avoid this fate your little ball can dig holes in the earth (although later stages include non-diggable segments) creating pits which the enemy will fall into. Once in a pit the enemy can be walked over and will eventually decompose and respawn. 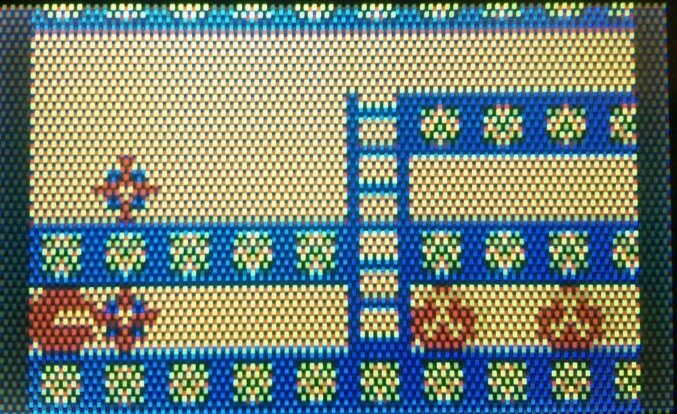 Your ball can also use pits to hop down to lower levels but he must be careful not to fall into one and be left unable to escape. The winning format of Lode Runner has led to numerous ports over the years and this unofficial GameKing clone does a great job in every aspect bar one. Sadly it is a crucial one. Oh, GameKing box art, you do deceive us so. Screenshots here were taken with the GK3, which is the only unit worth playing this on. Since it first appeared on home formats, the controls for Lode Runner have been the same: leftmost button digs left, rightmost button digs left. For some reason, whether by accident or not, the programmer's of Happy Ball have opted...to reverse them! That means that pressing 'B' (leftmost button) will dig right and 'A' (rightmost button) will dig left. In a game of such precision and perfect timing it's a hugely unintuitive control method that ruins the game. Unless you have a GameKing 3! For reasons best known only to TimeTop the GameKing 3's buttons, while outwardly appearing to be in the same configuration are inverted so that B on a GK3 does what A on a GK1/2 did and vice versa. The effect on playing Happy Ball is transformative. A decent job with colorization with no major colour clashes is another reason to try and track down a GK3 to play Happy Ball properly. 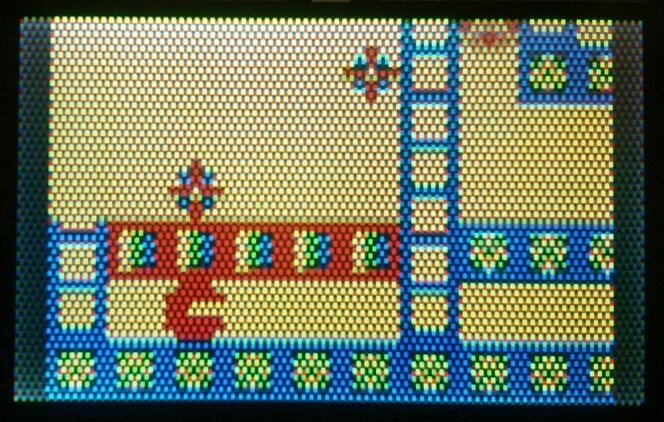 Played with the proper controls via a GameKing 3, which also does a nice job with the colorization, Happy Ball is a great game. Scrolling is smooth and fluid both horizontally and vertically. The sampled music provides a nice synth beat that feels continuous as opposed to the jarring cut that can sometimes be heard in other Game King titles. The gameplay is fun and addictive and pure Lode Runner with all of the tropes you'd find in the official titles such as being able to hang from wire to traverse pits, etc. It also has the benefit of longevity over most Game King platformers; somehow managing to squeeze ten whole stages out of the memory (when 3 is the norm for this system). It's a game that offers challenge and satisfaction...but only if you have a GameKing 3. So this is where we come to a quandry. 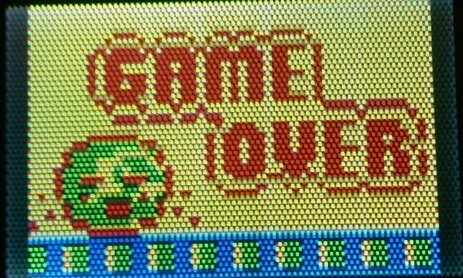 The broken, unintuitive controls of the game make it a maddening and frustrating experience on the original Game King 1 and 2 units. However the inversion of the controls on a Game King 3 transform it into one of the handheld's best titles. So, in a first for Obsolete Worlds, we are going to split the review score to be dependent on which unit you'll be playing it on. It's a shame that due to the scarcity of the GameKing 3 most people will be stuck with the former and forever denied one of the handheld's best games in a format where it can be enjoyed that way. Score (on a Game King 1 & 2) 5/10 - Boring Ball. 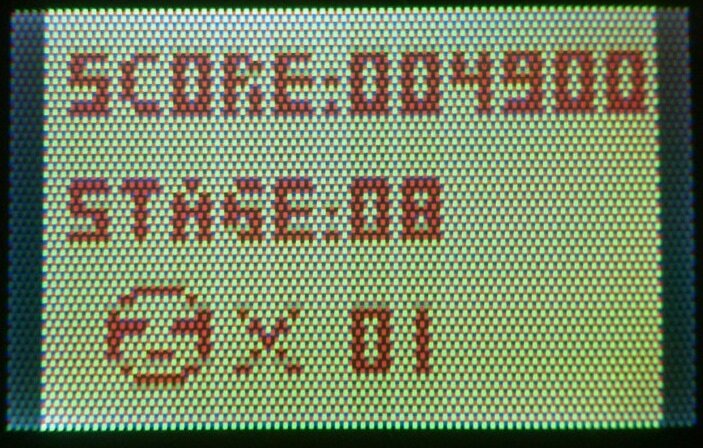 Score (on a Game King 3) 9/10 - Happy Ball.